His demo did not disappoint! I've been a fan of his work for years (who hasn't, right?) 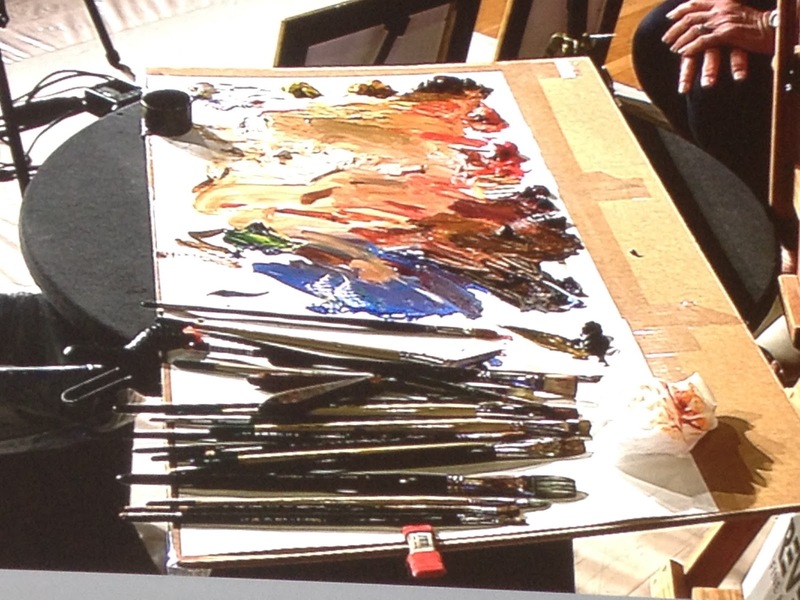 so it was a treat to watch him paint from life for the first time. If you watch the video at the end of this post, you will see a decent progression of his painting he made. He spent close to an hour and a half on it. I've been into brushwork lately. I'm into trying to improve my calligraphy in my brushwork, so it was a treat to see Dan paint, because I admire the calligraphy in his strokes a lot. I tried to take as many photos of his brush in action as I could. His setup. I don't remember his colors on his palette, sorry. Here he is signing his name on the finished piece. Super nice guy, by the way. 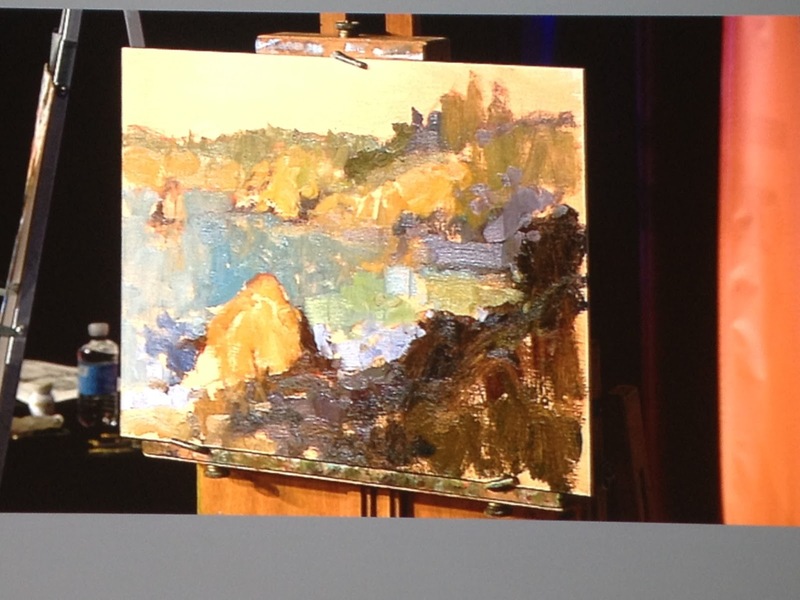 Charlie did a pretty cool demo of a monochromatic painting in water-mixable oils. I like his work, I think it's pretty unique. It's very different than most plein air painters. It harkens back to the illustrators of the 70's and 80's. It has echoes of Bernie Fuchs, David Grove, and the like. He was also a really funny guy! His sense of humor was a bit of cranky East Coast cynicism/sarcasm, but still warm and gentle. 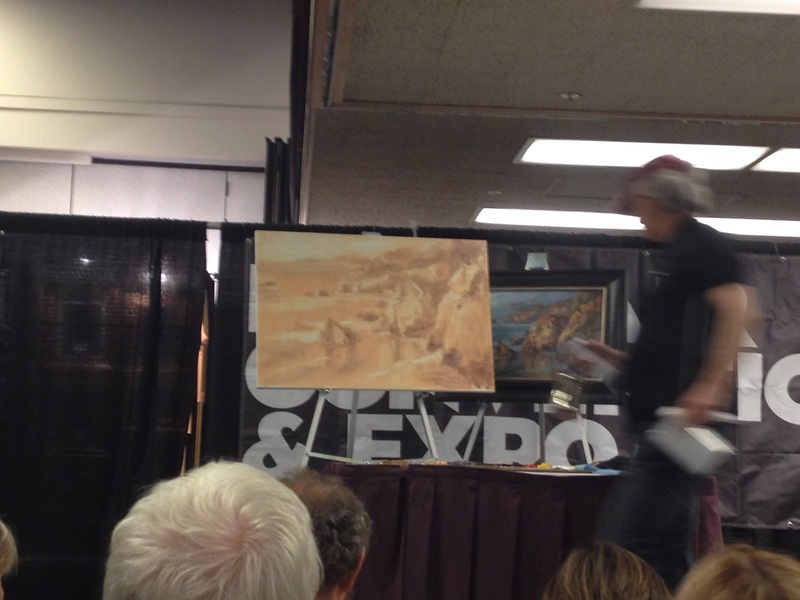 Something that stuck in my head was when he referred to the "Publisher's Invitational Paintout" as the "Publisher's Whoever-has-enough-money-to-make-it-to-Upstate-New-York" because, hey, it's not really an invitational is it? 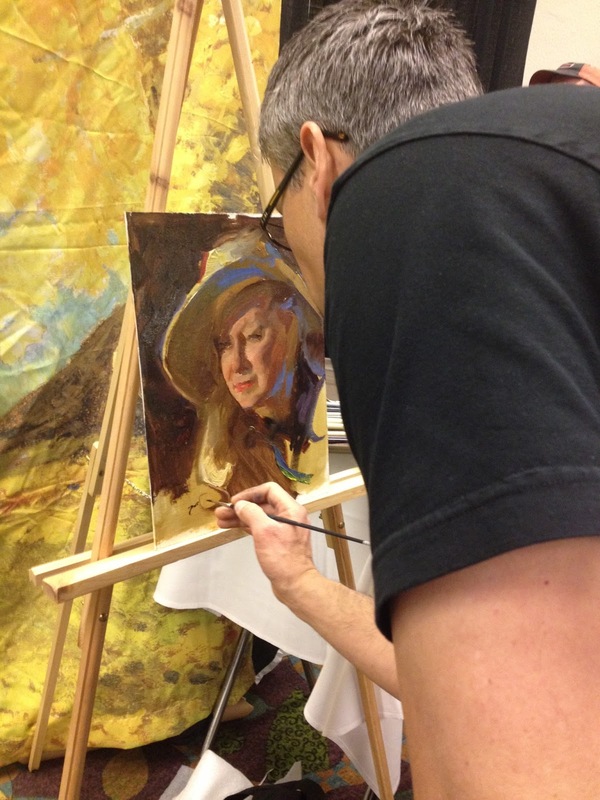 I picked up some tricks from his demo, because he likes to use unorthodox tools like squeegees, cotton swabs, toothpicks, ratty hake brushes and whatever else will make an interesting mark. ...but for about 40 minutes worth of work? Not bad, wouldn't you say?? 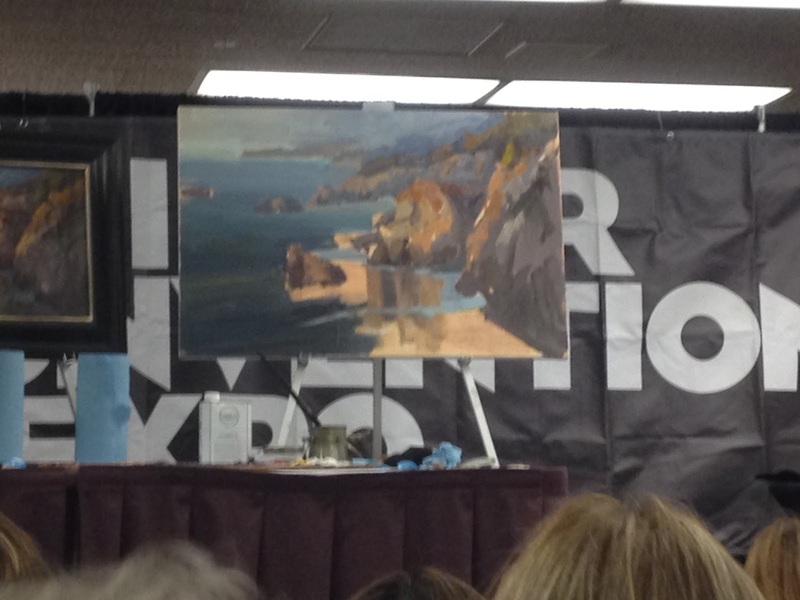 I didn't get great photos of Jim McVicker's demo, but I encourage you to look up his work if you've never seen it. 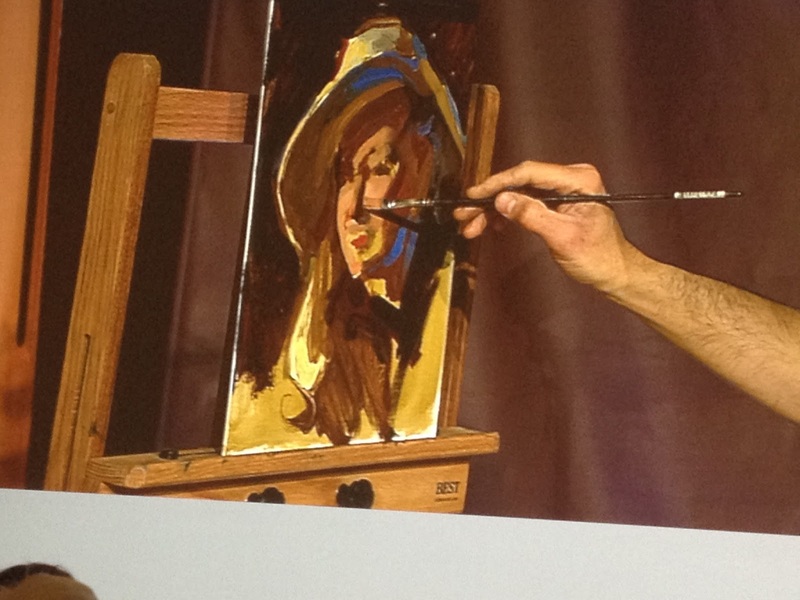 He's a great painter, awesome brushwork. If anyone out there has a good photo of it, let me know. Lori Putnam did a cool demo that was fun to listen to. Kevin Macpherson was watching, so she had to step it up. Lecture and demo time was over. Now it was painting time! We went out to Carmel Beach, which is quintessential California seascape. 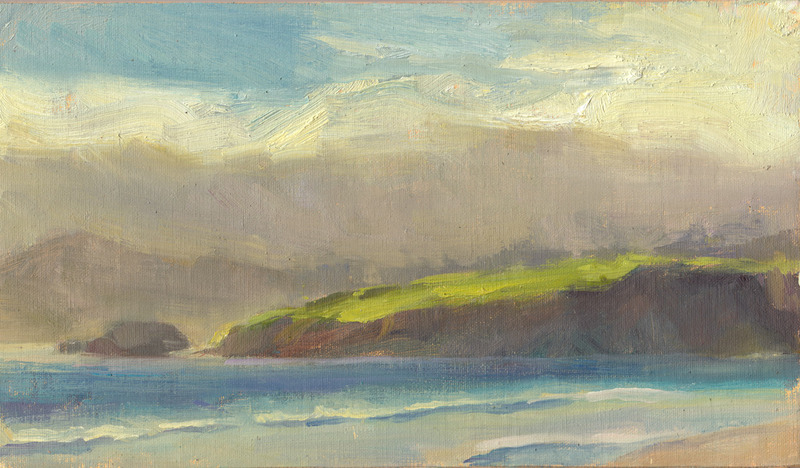 A classic beach that begs to be painted, and painted it does get. Especially with the hundred-or-so artists who peppered its white sands. I couldn't resist the light effect created by the silvery fog, so as quick as I can I painted this study. The composition is pretty awful, but I like the light effect. I may or may not do something with this later on. I almost didn't paint this one. I was just hanging around the other painters, knowing it was going to get dark pretty soon. Another irresistable scene showed up before me and so I set back up as quick as possible. I knocked this out in about 45 minutes. 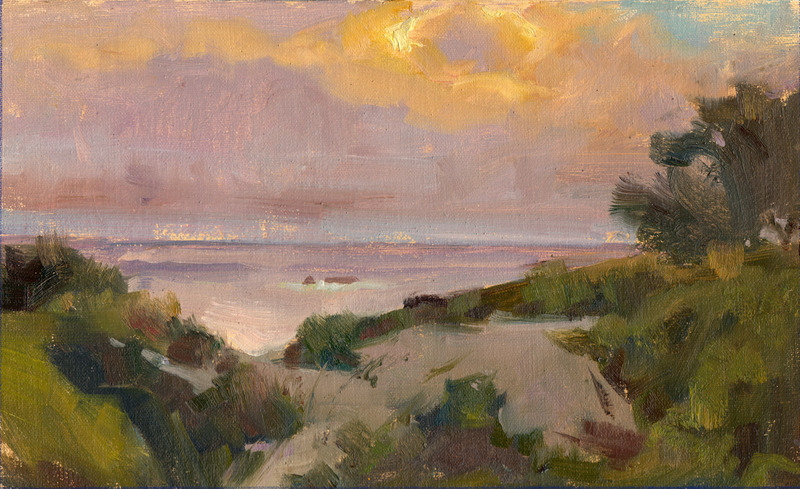 The key to this painting to me was getting the color temperature differences between the beach and the water. Value does a little bit of the job, but the feel of actually being there is done with the color temperature shift. "The Last Light" 6x10 in. oil on linen mounted on board. I finished right at beer o'clock. Time to hit up one of our favorite haunts: The Jack London Bar and Grill. No one has to know what we scribbled on our paper tablecloths. You just have to be there next year. Coming up next: Day 4 - The Conclusion of the event. 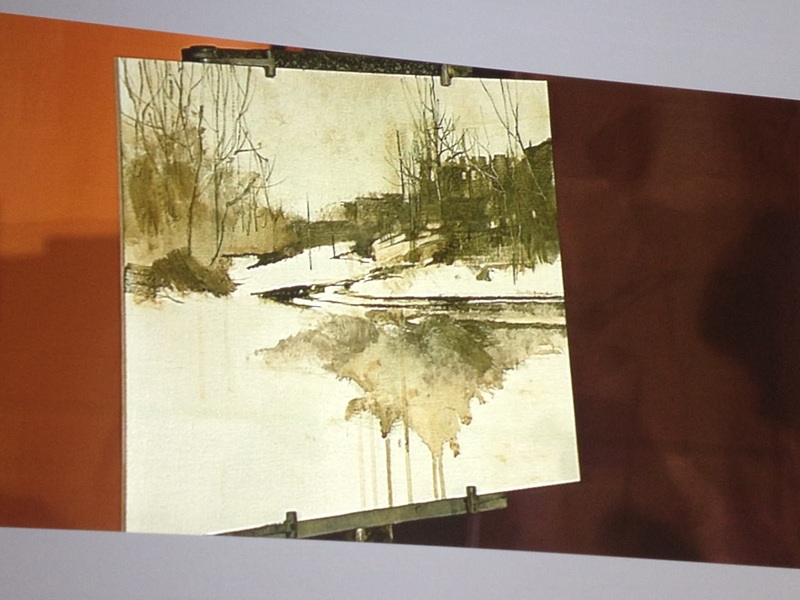 Also, bonus demos from the Palette & Chisel Academy from Chicago at the Mountainsong Gallery. If you missed part 1, I posted a video recap of the event with demos.Enjoy.